The idea of renovating your bathroom can be overwhelming, but you don’t have to knock down walls or gut the whole thing to make it feel new again. Making smart updates can get you closer to the look you want without the big budget, or the big hassle. This is one of our favorite ways to freshen up a bathroom because a new showerhead is: A) inexpensive, even for one that provides multiple heads and functions; B) an easy way to make your shower more enjoyable if you’ve been dealing with an old showerhead that doesn’t provide massage or handheld options; and C) also a money saver since new showerheads are more energy-efficient. Soaker tubs are the hottest trend in bathrooms right now, and it’s getting to the point where anything else makes your bathroom look outdated. Have one of those giant Jacuzzi tubs in your bathroom? It’s probably time to yank it out, especially if your jets stopped working long ago. 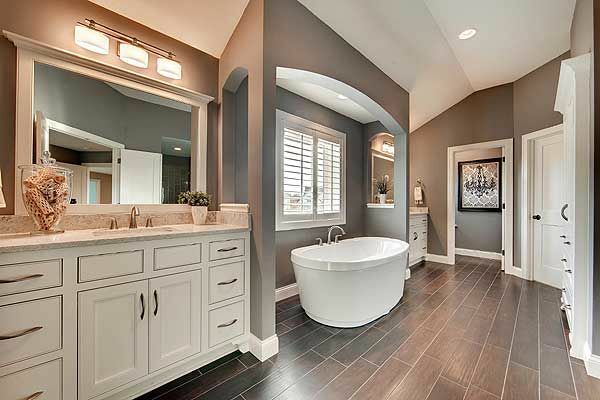 The bonus of a freestanding tub is it can also make your bathroom feel airier and more spacious. Your dinky shower with the tired tile and the metal trim isn’t fooling anyone. You don’t have to tear the whole thing down (but, if you can, by all means!) Removing the tile and replacing it with something more current can do wonders, especially if you’re going from something dark and cave-like to a choice that’s light, bright, and reflective. 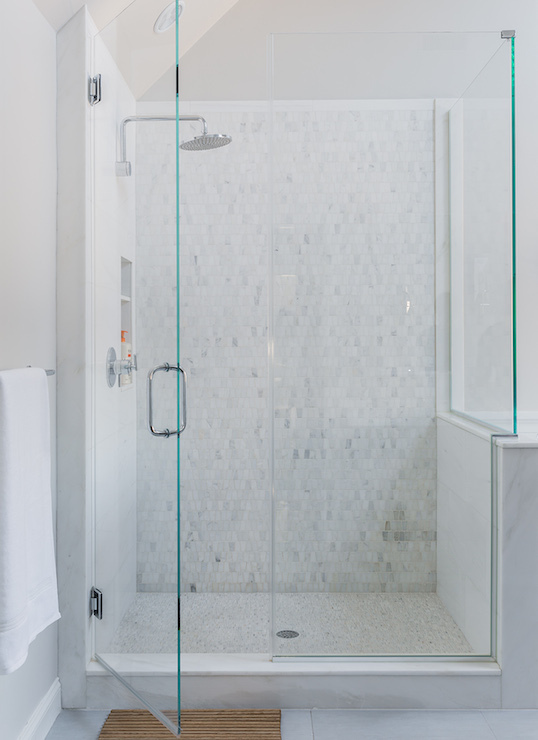 A seamless glass enclosure can give the shower a more expansive and current look with minimal work. Sounds funny to be think about replacing your large mirror with something smaller, right? After all, it’s a bathroom. But if you’ve toured a model home lately or watched a bathroom be remodeled on HGTV, you’ve probably seen this swap. 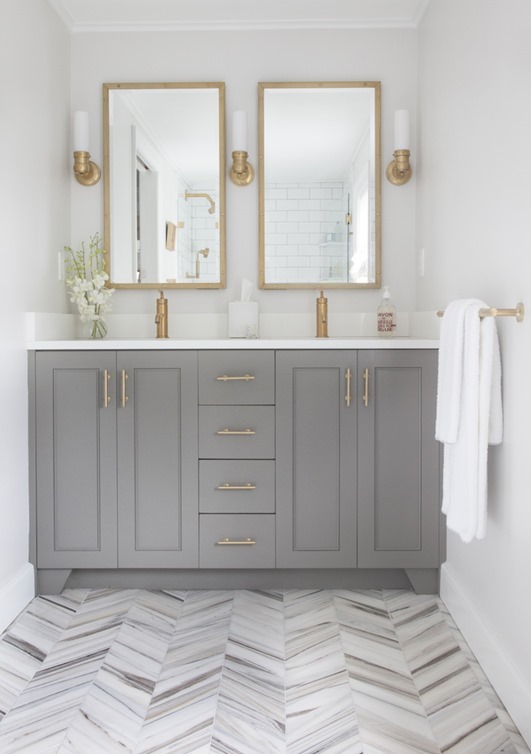 Taking down your full-width mirror and replacing it with something more tailored to the size of your vanity will instantly give the bathroom a lift. Have two sinks? Get two smaller mirrors. And make sure they’re framed out. A plain slab of mirror is just…plain. Those cheap builder lights are making your bathroom look DATED! Some of them are so bad they can make an otherwise stylish bathroom look not so great. Replacing the lights is easy (and inexpensive!). Just make sure to get your mirror situation figured out first so you know what width your lighting should be. 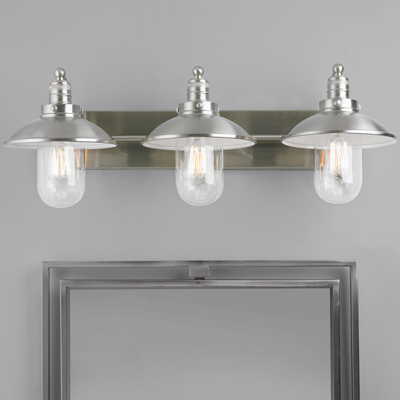 A light fixture that’s wider that the mirror is going to make everything look off. There are several ways to make an old vanity/sink combo look more customized and more updated. Changing out the faucets, painting the cabinets, and adding hardware can work wonders. But if the cabinet door or drawers aren’t in good shape, if the sink shape is just too dated, or if you just want to rip the whole thing out and dump it on the lawn, it might be time for something new. 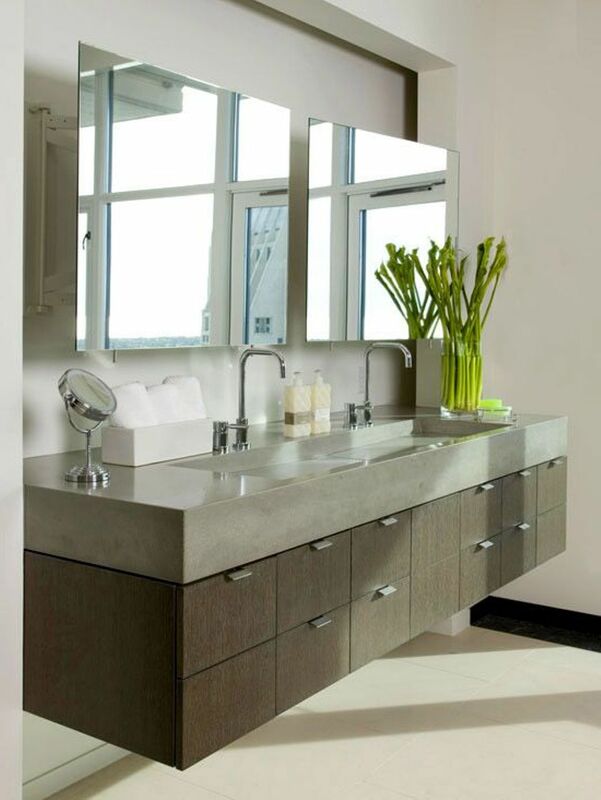 If you are going to replace your vanity, take a look at floating versions—a hot look today that that’s also great for a smaller space because it keeps the eye moving.